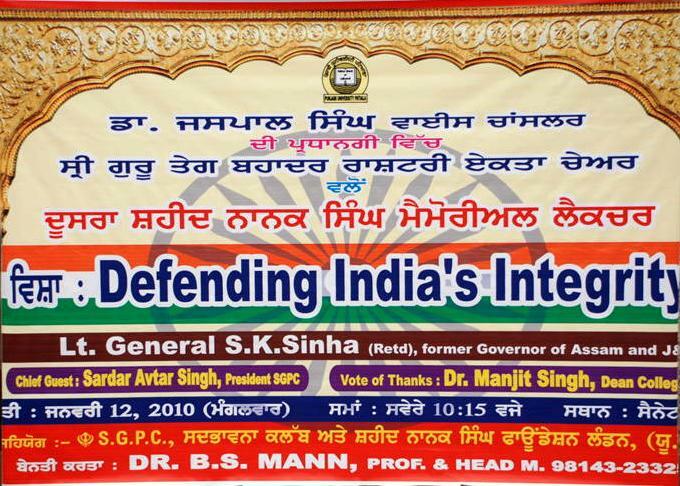 The Punjabi University’s Sri Guru Tegh Bahadur National Integration Chair organised the 2nd Shaheed Nanak Singh Memorial Lecture on “Defending India's Integrity” on January 12, 2010 in collaboration with SGPC and Shaheed Nanak Singh Foundation which was delivered by Lt Gen S. K. Sinha (Retd. ), a former Governor of Assam and J and K.
Prof Baltej Singh Mann, Head of the Sri Guru Tegh Bahadur National Integration Chair, welcomed the guests. 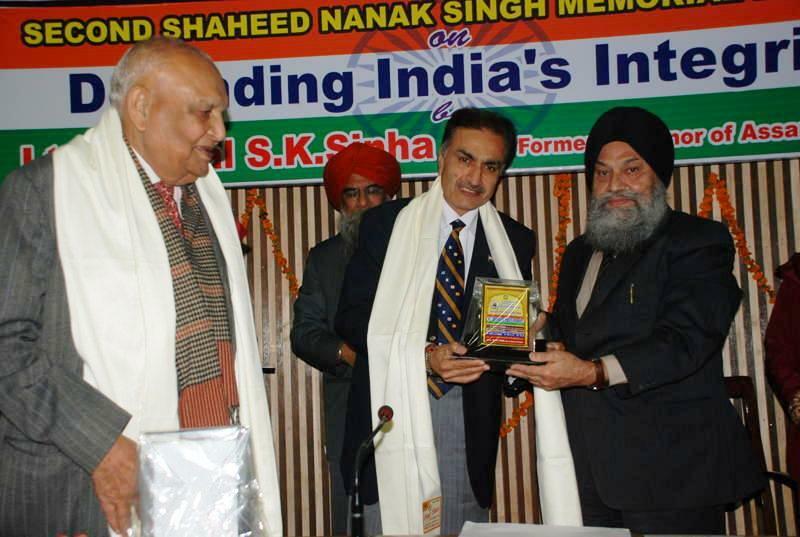 Paying rich tributes to Shaheed Nanak Singh, Dr. Mann said that he was a dedicated and spirited citizen who made a phenomenal sacrifice to promote religious tolerance and human freedom. He was done to death in the pre-partition carnage as he was trying to save some students of a school who had organized a peace march against the division of the country. Lt. General (Retd.) Niranjan Malik, former Deputy Chief of the Indian Army, introduced General Sinha and shed light on his illustrious career as an outstanding soldier, diplomat and a public servant who is serving the Indian nation for over six decades with utmost loyalty, dedication and integrity. His noble services as Deputy Chief of the Indian Army and as a Governor of Assam and J & K will become the part of the history, Gen. Malik added. Lt Gen (Retd.) S. K. Sinha, a former Governor of Assam and J and K , while delivering the lecture said "We are facing biggest external threats from China and Pakistan and we need by develop a multi-pronged strategy to tackle these threats. We have been facing threats from Pakistan since 1947 and from China since mid-fifties but have done little to improve our capability in the Himalayas , while China has been feverishly increasing its military capability in Tibet and building elaborate infrastructure.” While talking about the internal threats, Gen Sinha suggested that secessionist threats in the North East have to be tackled through inflicting maximum attrition on the militants. Concurrently, through economic development and psychological initiatives, we need isolate militants and win hearts and minds of people. As for the secessionist movement in Kashmir, apart from containing violence, we should give priority to media management for effectively countering anti-India propaganda. While expressing his satisfaction about effectively handling the Naxal terrorism, Gen. Sinha advocated for providing modern weapons to our Police and para-military forces and preventing politicization of these forces. 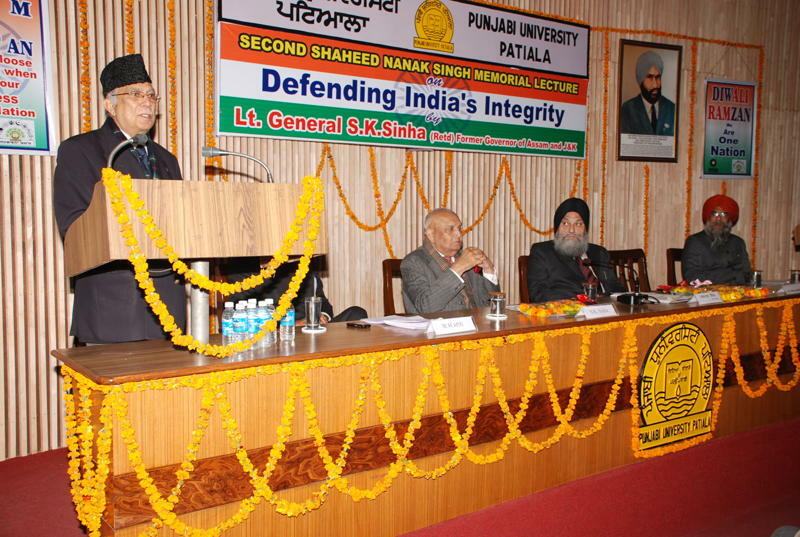 Dr. Jaspal Singh, Vice Chancellor, Punjabi University Patiala, in his presidential remarks, said that India has been witnessing many challenges during the course of history that would have fragmented it but for the inheritance of a multi-ethnic, multi-religious and multi-caste society that helped us to maintain our national integrity. We must not, however, ignore the fact that there is need for utmost vigilance and caution to sustain such an inheritance. The chief characteristic of our civilization has been unity in diversity, even as we never did attempt to impose uniformity or dilute diversity. The continuity and strength of our civilization process depends on this implicit recognition of our ancient value system, he said. 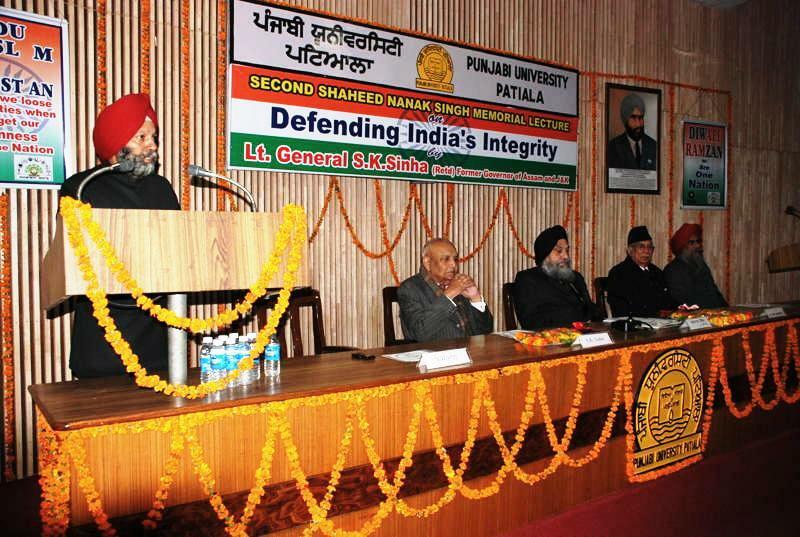 Dr. Manjit Singh, Dean, Colleges while proposing a vote of thanks said "Nanak Singh belongs to that rare class of distinguished world citizens who will long be remembered by his countrymen with deep admiration"
Maj. Gen. SH Kulkurni PSM, GOC 1 Armd. Div. Patiala, Maj Gen. (Retd.) 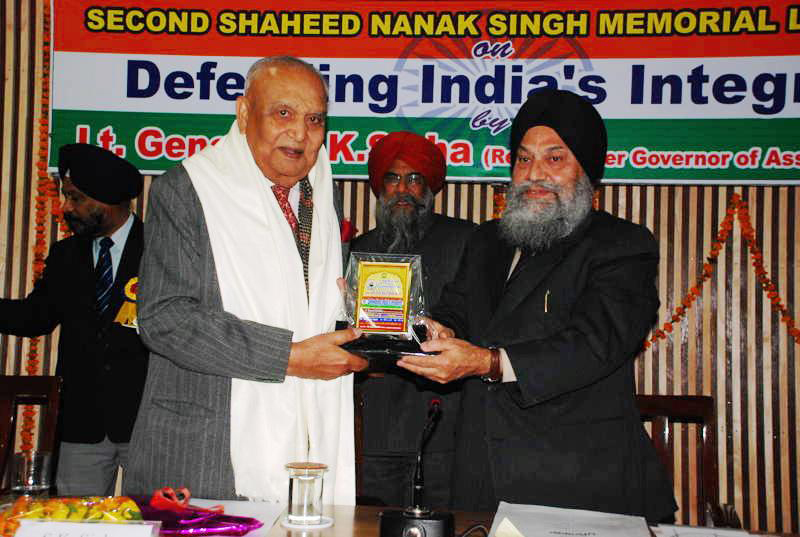 Gaganjeet Singh, Lt. Gen. (Retd. 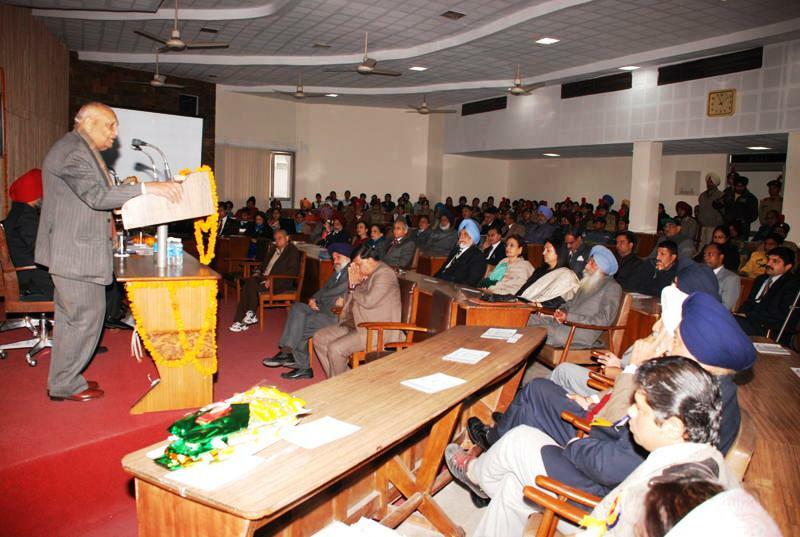 ), Deepender Singh, Former MA to Field Marshall Gen. Sam Manekshaw and Mr. Mukesh Anand, Chairman Shaheed Nanak Singh Foundation SAARC Region attended the lecture along with 200 dignitaries. General Niranjam Malk introducing General Sinha. 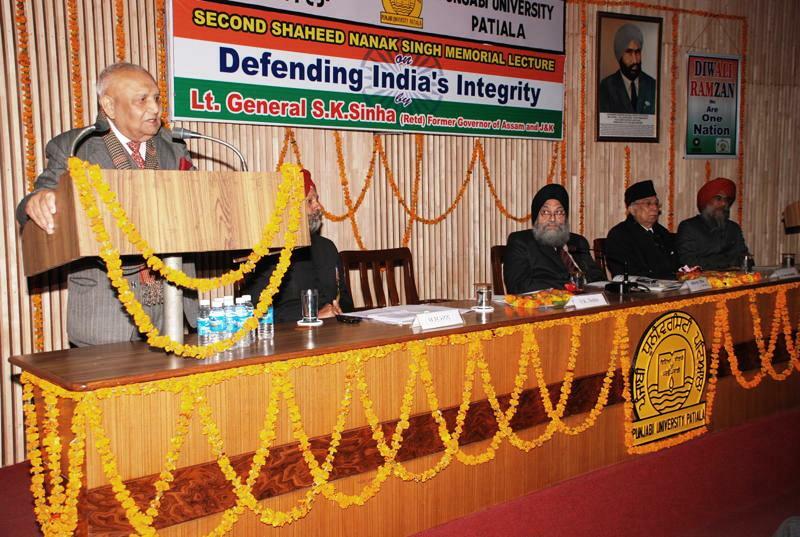 General Sinha delivering the second Shaheed Nanak Singh Memorial Lecture. 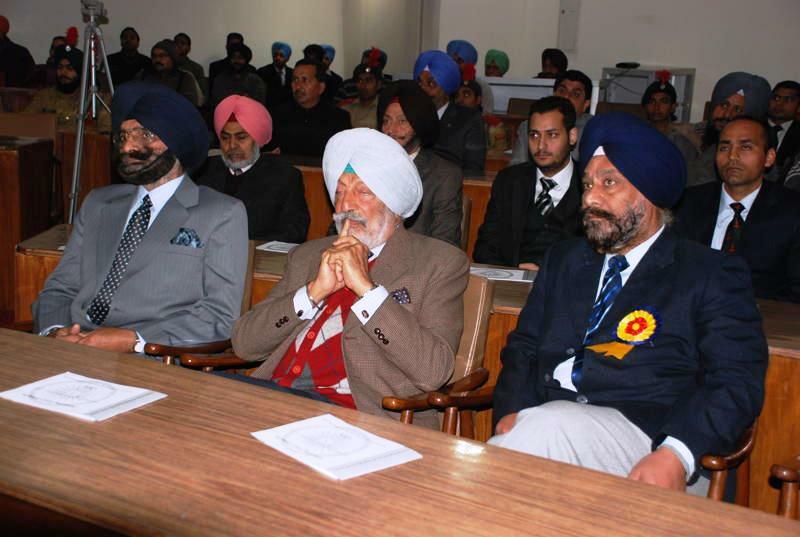 Lieutenant General Deepender Singh (centre) along with a guest. 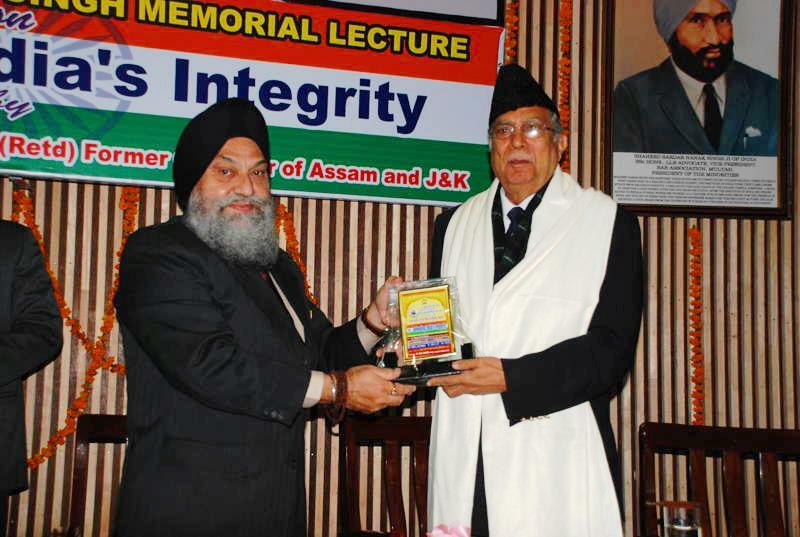 Vice-Chancellor Dr Jaspal Singh presenting SNS Memorial Plaque to General Sinha. to Mr Mukesh Anand, Chairman of the SNS Foundation, SAARC Region. General Sinha looks on (Far left) .